Huber Wash located on the high desert of southern Zion National Park , is an easy hike that can be done in the winter when many of Zion's other trails are closed due to ice and snow. Petrified-wood, can be found in select areas of this hike, including at the end of the trail. Keep in mind that you are in a National Park and collecting anything like this is forbidden by the NPS. Pack Animals: Group size is limited to six animals. Contact the park for limitations. Difficulty: This moderate route is through a wash. Although considered moderate because it is a route rather than a trail it has little elevation change and is not taxing. Permits: Required only if camping. Campers may only stay in one location for one night. Trailhead: Just west of Rockville. Drive about 6 miles south of the south entrance to Zion. Look for the "Huber Wash" sign. Park 100 yards west of the Huber Wash sign if driving from Rockville. 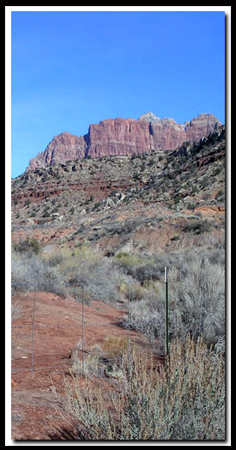 Trail Access: The route begins just off Highway 9, so it is always open but when the land is wet its uncomfortable to hike this wash.
Off the Beaten Path: Yes, the route is outside the popular section of Zion. Best Season: Late fall until late spring. Cryptobiotic soil is one of the oldest living forms of life. If damaged it can take several decades to repair itself. The crusty ground cover is made up of mostly cyanobacteria, but algae, lichens, moss, bacteria and microfungi are also involved in the makeup. Long ago these were responsible for changing the earths original atmosphere one that is filled with life sustaining oxygen. Petrify means to "turn to stone." It is the fossil of a woody plant that has changed over a long period of time due to stress, and chemical formations within the root of the structure. It only forms under specific conditions, of which are ideal in this wash. Please leave all petrified wood where it lays so all visitors may enjoy it. Huber Wash is a short and easy hike through a wash, south of the popular section of Zion National Park. Only hike this trail when its dry as it tends to get muddy and slippery. Park near the "Huber Wash" sign, seen from Highway 9, Just west of Rockville. 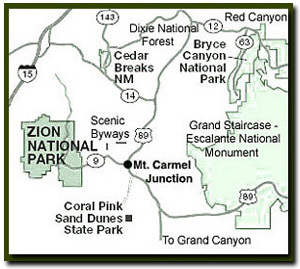 The sign is located about 6 miles from of the south entrance to Zion. From the "Huber Wash" sign you can see a gate. Pass through and be sure to close the gate behind you. Immediately after passing the gate, head to the right (east) paralleling route 9 . There is a path of use that leads toward the Huber Wash. Follow the beaten path 100 yards and down into the wash. Turn north (left) once arriving at the bottom of Huber Wash and follow the dry wash . After about .3 miles of hiking in the wash the Park Boundary is marked with a fence and hikers gate just above the wash on the left. Close this gate behind you. Beyond the gate is the national park boundary. Mount Kinesava is the mountain range in the distance. The Rockville Bench is to the southeast. Continue upstream, staying in the main wash. Do not wander out of the wash, to avoid damaging delicate cryptobiotic soil. Look for petrified wood throughout this hike, however scavengers have stolen most of the small pieces. After an easy 2- mile hike the wash ends in an alcove or dryfall. At times there is a nice waterfall in the alcove, but there is always a nice display of vegetation growing in the alcove. In the winter there can be icicles hanging on the sides. Be sure to look for the petrified log-jam on the right side of the wash.
Options: Exploration of the Chinle Trail , Coalpits Scoggins or Huber Wash.